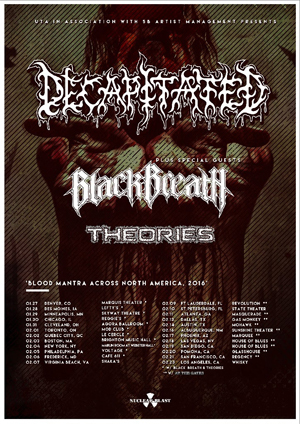 Polish technical death metallers DECAPITATED will return to conquer North America once again this upcoming January! Just prior to being direct support to AT THE GATES on their U.S. tour, the band will do their own headlining run with support coming from BLACK BREATH and THEORIES. "We’re very excited to announce that we will be returning to North America in January and February as a part of the AT THE GATES tour, along with our first headline dates in over 3 years. As you probably know due to unexpected problems with U.S.C.I.S. we were forced to cancel our tour with SOULFLY in October this year. We can’t wait to get back and play for our loyal fans all over North America and we hope to see you there! Nothing will stop us this time!!!" "The beginning of 2016 is gonna be awesome. We are coming back to United States and Canada!!!. As we all perfectly know, North America is one of the best place to play hard music. This continent was simply built on a Rock and Roll music, and I feel it every time we play there. Amazing crowds, constant headbanging and of course unforgettable shows. North America are you ready?! We are coming! See you there!"